Las Vegas (the Meadows or grassland) was a name given by the Spaniards who used water in the area while heading north and west along the Old Spanish Trail from Texas. In the 1800.s areas of Las Vegas Valley contained artesian wells that supported extensive green areas or meadows.John Freemont travelled into the valley in 1844 when it was still part of Mexico. He was a leader of a group of scientists, scouts and observers for the U S Army Corps.In 1855 following the annexation to the U S, Brigham Young sent 30 Mormon missionaries to convert the Paiuti Indian population. A fort was built near the current down town area, serving as a stopover for travellers between Salt Lake City and a colony at San Bernardino, California.Las Vegas established itself as a railroad town in 1905 when 110 acres were sold off. 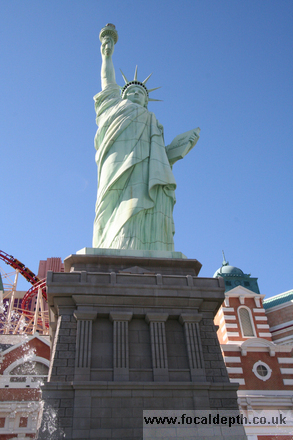 New York-New York hotel and casino uses the New York theme and has a recreation of the city's skyline. There are representations of the Empire State Building, the Chrysler Building, Brooklyn Bridge, Grand Central Terminal and a large pool in front of the resort with a 150 foot replica of the Statue of Liberty. There are even fire boats spraying jets of water into the air. Another feature of the hotel is The Roller Coaster which travels around both the interior and the exterior of the building and reaches speeds up to 67 m.p.h. New York- New York was opened in 1997.